Contact us today at 704.845.0561 to get on our waitlist via telephone or click here to download the registration form. Once complete, please email the form to margaret@childspeechlanguage.com or fax it to 844-294-3070. Give your child educational enrichment AND fun through our exciting speech and language summer camp! In their early years, children typically are still developing their speech and language. Our innovative curriculum will help support your child during this critical development process. Prior to the beginning of camp, we will meet with families individually to go over the speech and language goals developed for their child. At this time, you will have the opportunity to express any concerns regarding the speech, language and learning process of your son or daughter. With a maximum of only 7 children for the Davidson Camp, this summer camp is extremely customized to ensure we address the individual needs of each child. In addition to daily group work, your child will receive individual speech therapy sessions with one of our speech therapists to work directly on their specific, targeted goals. Each activity will facilitate children’s speech and language use and help them to expand these skills. To reinforce these newly learned skills, parents will receive a list of activities to do at home. 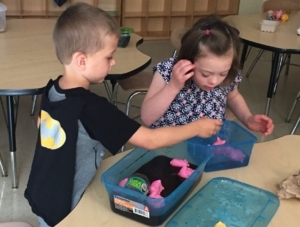 Our summer camp, led by experienced speech-language pathologists (“speech therapists”), will provide a fun, interactive and engaging experience for all children. We will utilize numerous modalities (auditory, visual, physical movement, kinesthetic) to engage our campers. And our camp promises NOT to be boring! We will also go outdoors each day (weather permitting) to keep the campers up and moving while learning during our fun-filled sessions! WE HOPE YOU CAN JOIN THE FUN! Each camp will feature the same curriculum but will be modified to accommodate the needs of the campers. Because your child will receive a GREAT DEAL of one-on-one, customized time working with our expert staff, space is EXTREMELY limited for each week of camp-we have a cap of only 7 children per camp. Consequently, all applicants will be processed on a first come, first served basis. A one-time, non-refundable deposit of $55 reserves your child’s space for the week(s) you wish. In order to ensure a space in the summer camp, it is important to make the deposit at your earliest possible convenience. Your full weekly tuition must be remitted a minimum of one week before the week(s) your child is attending camp. Payments may be made by credit card or personal check. Please note: Tuition is based upon your child attending five days per week. If your child attends fewer than 5 days per week, no proration can be made to the weekly tuition because of staffing logistics. However, in the event of an unexpected facility closure, tuition will be prorated accordingly. Again, space is EXTREMELY LIMITED!